Mezumenet certainly isn’t “mezzin’ around” as the university’s all-female Jewish a cappella group prepares for the launch of its new album, Mezcellaneous. Mezcellaneous is the group’s third studio album and will be released on Spotify on April 17. The album has a total of 11 songs and contains a combination of pop songs, Jewish parodies and Hebrew pop songs. Each song on the album is a cover, with the exception of the parodies, which have been created from existing pop English songs. The group began the process of creating an album over the summer. After coordinating everyone’s schedules, the group met in August to work with a sound engineer and began the recording process at the Hillel center on campus. Releasing an album also requires a significant amount of fundraising. The group created a page on Jewcer, an online fundraising corporation specifically for Jewish groups and organizations, and raised $9,000. Before the music is made available to the public, it must first be digitally licensed for platforms like Spotify and iTunes and mechanically licensed for the sale and production of the CD itself. CDs will be able available for sale online and at Hillel events like the fall Opening Barbecue, Marcus said. 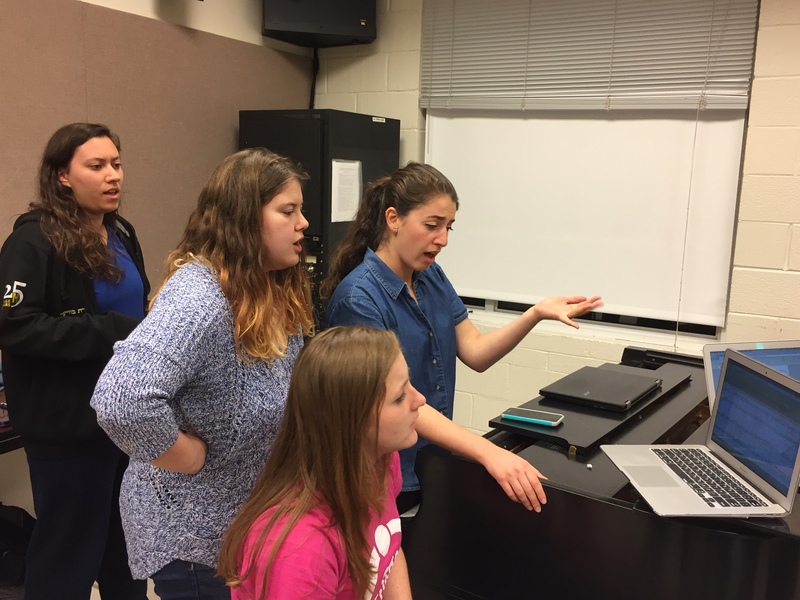 Music director Jenna Marcus leads the girls as she conducts the different harmonies and layers of the song. Morgan Politzer/Mitzpeh. The video takes place at the end of a long Shabbat dinner as the guests are ready to leave for the night. In Yiddish, “benching” is the word for saying the prayer after meals, said Marks, a sophomore elementary education major. “The whole premise of the song is ‘you’re done a meal, let’s just say the end blessing so we can go home,’” Marks said. Senior broadcast journalism major Ryan Sevel filmed and edited the music video. After getting approval, Sevel sat down with the lyrics and planned each shot and scene based on what was happening in the song. When the video was filmed, the final audio track of the song was not complete, so Sevel used the rough recording during the shoot to make sure the timing of the video was in line with the lyrics. During the editing process, Sevel took out the original audio and added the finished track back in. Once the video was complete, it was uploaded to YouTube and launched on social media. No Replies to "Mezumenet's new album opening on high note with music video release"